POWER DRILL MASSACRE (2015) - Injured after a car crash, Megan flees through the woods into an abandoned building, looking for help. The door jams and shes locked inside, forced to search through the dark corridors. She hears the echo of a power drill in the distance and realizes she's not alone. Power Drill Massacre is now available for purchase as an early access game. 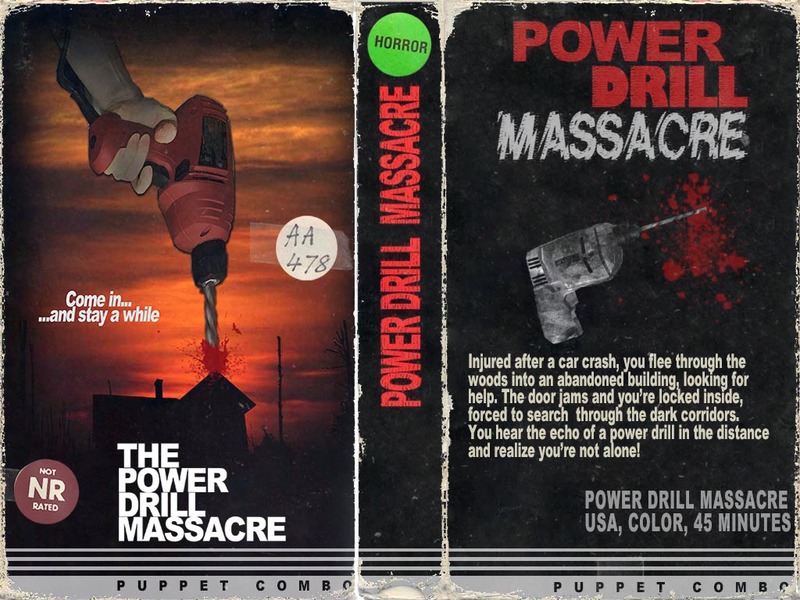 You can now get Power Drill Massacre on disc! 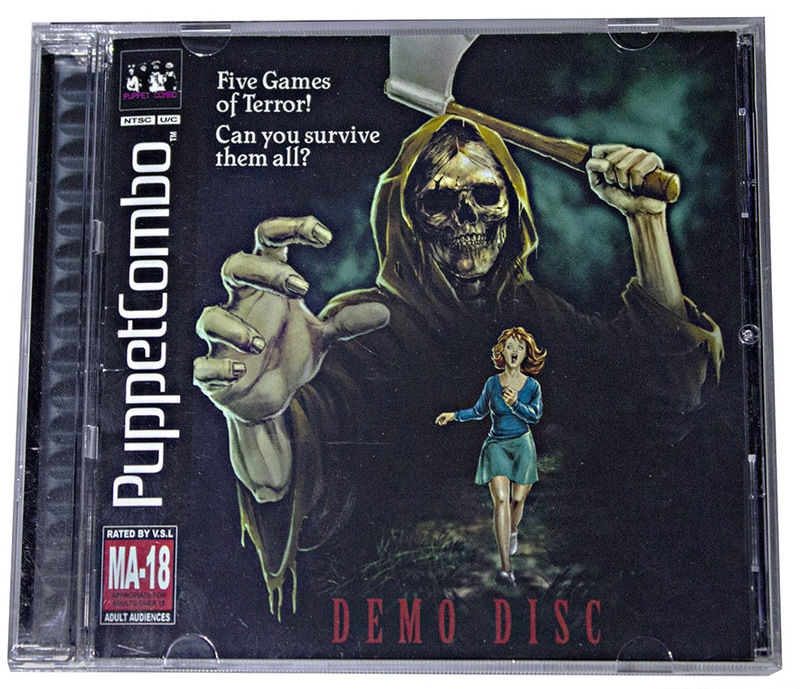 It's part of the Puppet Combo demo disc along with 4 other games. Including Stay out of the House and Texas Butcher! 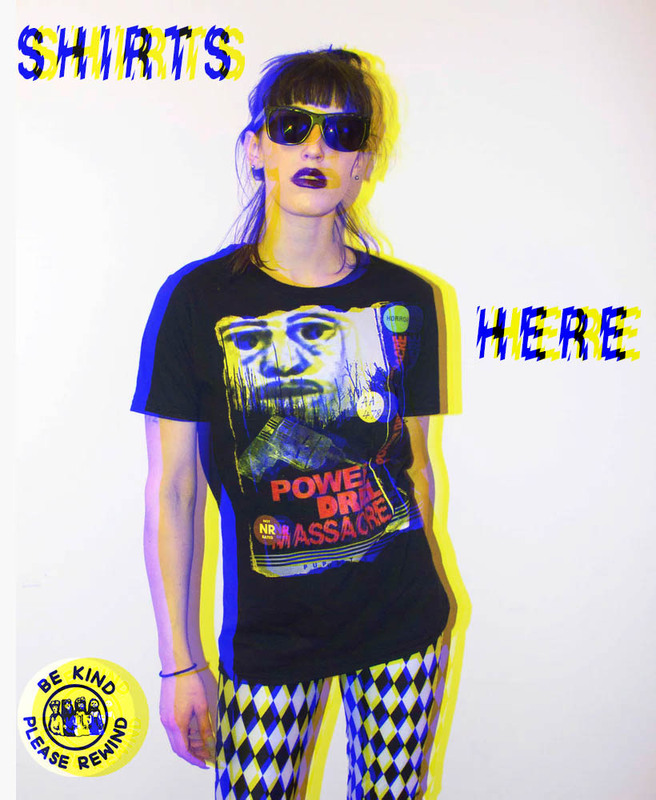 Be the DEATH of the party with a Power Drill Massacre t-shirt. this game was a lot of fun. i played resident evil 2 remake recently and this game still got me with the scares and tension. really great homage to all medium of horror from the movies and video games. looking forward to the rest of the games from you guys in the future. here's a video of my wife and i playing the game for one of our segments on the freakin' awesome. Can the camera perspective change? from 3rd to 1st? Just wondering, if I buy the "demo disc", will I qualify for the Steam key for Power Drill Massacre? Are you planning on bringing any of the other games featured to Steam? Just wanted to say your guys games are AMAZING. Also,is there an estimate date of when the game will be done? Do you guys have a plan to port the game into Nintendo Switch? That would be awesome! What was the cause of the delay from October? Love your games btw, perfect for a good unexpected bowel cleansing. THE ARCADE VERSION IS SO COOL :o I'm so glad you guys added that! Can't wait for the official release! So, what is the full price of the game? Failed experiment to play in the dark - webcam became too dark. fml. Well, I still showed I got the balls to play any spooky game in the dark :P the rest is getting further in the game. This game is absolutely terrifying! I nearly had a heart attack while playing it! I played this game like a year or two ago and I found it absolutely terrifying! Probably the scariest game I have ever played. Great Job! Another great outing, nice work. I screamed so hard I knocked my freaking keyboard shelf off. Thanks. This game is amazing! The art style and nod to the cliche horror movies of old adds a level of horror and unknowing that puts the player on edge. I mentioned in my Let's Play that the way the game is made reminds me of what a snuff film would be like, but maybe that was a tad excessive. It's more like that the horror movies today are dumbed down and only bare-bones, so something this intense is a shock. Either way enjoyed the heck outta this! Thanks for making it! Cool game, but I'm terrible at it apparently. I said I hate it, but I more just hate myself for being terrible at games. I hope at some point you finish the full game of this, it's genuinely terrifying! Hey, do you think it'd be possible to provide a "portable" (just a .zip archive) version of the game for better compatibility with the itch.io app? See this guide for more details, also, take a look at butler for uploading. Thanks! Hey, really awesome game haha i rather enjoyed it honestly. I made a short video of me playing it if you are interested in seeing my reactions. I'm looking foward to playing your other game this month as well.